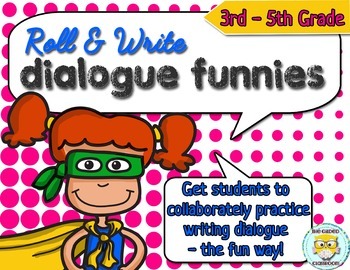 Get students to collaboratively practice dialogue writing - the fun way! 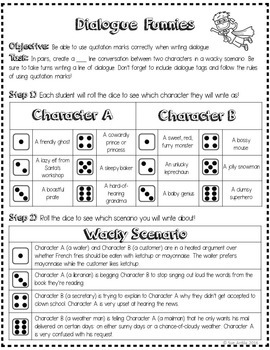 Students simply roll their way to writing a silly conversation between two characters in a hysterical scenario! Use this resource any time of the year! 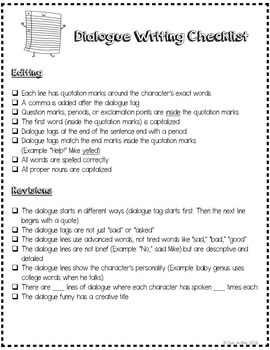 Choose the number of dialogue lines that best fits your students’ needs! *Please note that a die or a numerical spinner is needed for this resource. 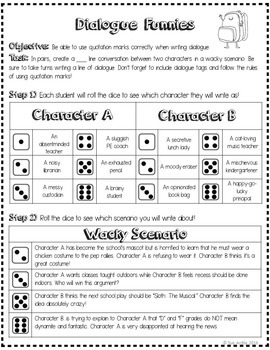 2) Dialogue Funnies printable set (p 4-9) – 2 anytime practice sheets and 4 themed practice sheets (Halloween, Fall, Winter, Spring). * When printing, make sure to select "FIT" for best results. Great for centers and partner practice!